Today, I get to join a new faith formation group! I am starting in the formation of an Ursuline Associate. 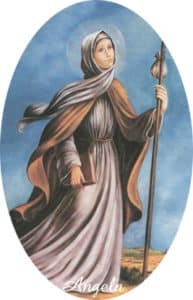 I can’t wait to learn all about St. Angela Merici and her order of Ursulines. I have read books about her and studied the Ursulines, but I can’t wait to learn more. Sacred Heart Academy is part of the Ursuline community. I feel that as the retreat director I need to learn all I can about the roots and spirit of the women who started this community. Plus I love having new people to share our faith!